I am what Catholics call, a Revert. I once was a cradle Catholic, converted to the Presbyterian Church (and for two decades held Fundamentalist beliefs), and then reverted back to Catholicism. These changes were not caused by confusion or resentment, but rather as a means to continue to grow in the faith. Looking back on it, I can see that my Spiritual journey, while a bit unconventional, has been a blessing. While I will not be discussing doctrinal specifics in this posting, suffice to say that I was drawn to Protestants because of their love of Bible study. I knew that I, and many of my fellow-Catholics, did not place as much emphasis on the Scriptures as they deserved. Sure, every mass had readings from the Old and New Testaments and the Psalms, but I and my friends simply listened passively rather than actively investigating the Scriptures. During those twenty years, I heard many comments and sermons - and read many books - that attempted to explain why Catholic beliefs are in error. So, I focused my studies more on the Bible and the history of the Church in order to arrive at my own conclusions. Over time, I became increasingly uncomfortable with those criticisms because, too often, they were either based on misunderstandings or outright misrepresentations. I do not say this to call into question the faith of those Protestants. Many of them deserve heaven far more than I can ever claim. Their words of criticism are shared with honest intentions. But, I must say, I have never heard a priest criticize Protestant beliefs the way I have heard Preachers condemn Catholic beliefs - and many times, incorrectly. I came to believe the words of Archbishop Fulton J. Sheen: "There are not more than 100 people in the world who truly hate the Catholic Church, but there are millions who hate what they perceive to be the Catholic Church." 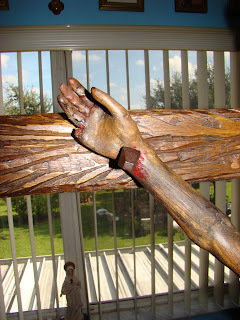 My reason for this posting is for an instructive follow-up to my previous comments on the Pilgrim Crucifix. As Father John J. Pasquini points out, Protestants often criticize Catholics for “worshiping” statues. They say it violates Exodus 20:4-5 in which we are forbidden from worshipping man-made idols. But, reading further to Exodus 25:18-22, we find that God gave specific instructions for Moses to “make two cherubim of gold.” Are they graven images? In fact, the burial grounds of the earliest Christians - the Catacombs - included visual symbols for Christ and biblical representations of him. Not only do Protestants rightly treat the Cross and the Bible with reverence but browse through any Protestant bookstore and you will find that even children’s books are illustrated with images of Jesus Christ. Are they worshiping these images and objects? Of course, not! And neither did we worship the carved wood of the Pilgrim Crucifix. To illustrate this point, I am reminded of what happened near the end of my first visit with the Pilgrim Crucifix and its custodians. Over the years, Myriam and Idelcy had overcome monumental obstacles in transporting the Crucifix with the respect it deserves. They had kept the carving intact after many thousands of miles of travel. Then, the next morning, we realized that a finger was missing. I might have blown a gasket! But, to my surprise, Myriam and Idelcy were perfectly calm and accepting about damage. They just said, “Don’t worry about it.” It was clear that they were completely ready to accept God’s will, even when it is not expected. That lesson truly reinforced for me that Protestants are wrong when they think Catholics “worship” statues. It is not wood, it is not marble, it is not even gold that we worship. We worship the one, true God! And we thank God for blessing us with miraculous manifestations of His love through this Crucifix. Also, to my Protestant friends, we love you even when you don't understand us ;-).